I'm really trying to weigh my options on going to BlogHer 13 in Chicago. My partner in crime, Megan is not going to attend as she has a glorious reason to save money. I really enjoyed my trip to BlogHer last year. I met some great people and had the best experience, had a chance to connect with some great brands and the sessions are great. Not to mention, it was in the greatest city on Earth and I got to dance with the Rockettes! I really want to go this year, but I feel guilty going by myself and spending the money after the wedding last month. I decided to enter a contest that The Mission List is holding. 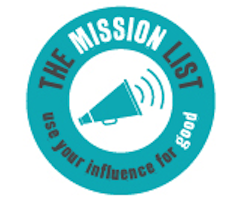 The Mission List connects non-profits, NGOs, and socially conscious, pro-woman brands with people who are passionate about taking meaningful steps to increase awareness of and take action for social good causes. If nothing else, I am so glad I have had a chance to learn more about The Mission List and I will be participating in the future. It's in Chicago. I have never been to Chicago and its on my top five list to visit. Everyone says I will love it and I think it would be a lot of fun. As much as this girl loves NYC, the Chi-town food and the atmosphere is calling my name! Its all about the speakers 'Last year Martha Stewart and Katie Couric were two the keynotes so we awaited patiently to see what was really up BlogHer's sleeve this year. The names did not disappoint! Ree Drummond,, Sheryl Sandberg , Brit Morin to name a few! All iconic women in my social media and blogging world. It is always nice to hear from women who have made what you do a success and a reality, If I dont go, I sure hope they telecast it. Great Brands and Great Swag. Yes, the swag is good but the brand face to face is better. Last year Megan and I had a goal to get out there and talk to brands that we could relate and connect with. This gave us some awesome opportunities and great relations with really cool brands like Wholly Guacamole, Manilla, Dole, to name a few! The stuff was great to take home and share, Im not gonna lie, that was really neat! Like minded individuals-I just read a great article from Nina Badzin. Notice that is a couple years old, but she says she stands by every word to this day and I would too. Its nice to know that there are people out there that you don't have to badger to read your blog. People that don't look at you like you are crazy and say..Wait, you do this for FREE? People that get it. Even if they are strangers, being in a mecca of blogger gives you a sense of unity! Attending conferences like BlogHer strengthens this mentality. I have made some great connections even by following the #blogher13 feed on Twitter. Reignites the Blog Bug- When I came home from BlogHer last year I have almost a dozen different blogs I wanted to write! There are still things in my notes that I never got to. Conferences like these inspire you to write and blog and write and blog some more! I come to learn- On top of all this, the breakout sessions are awesome. Whatever the reason you sit with your blog day in and day out, BlogHer has a session and a track with you in mind. Check out their schedule here. I REALLY REALLY wish I could pull off a trip to Chicago this year. I am beyond saddened that I cannot join you. I really hope you win this opportunity!